In the bygone era of film, one had to wait days to find out how your photos turned out. Now we can see the image right away on the back of the camera and have it copied to our computer minutes after the end of the photo session. 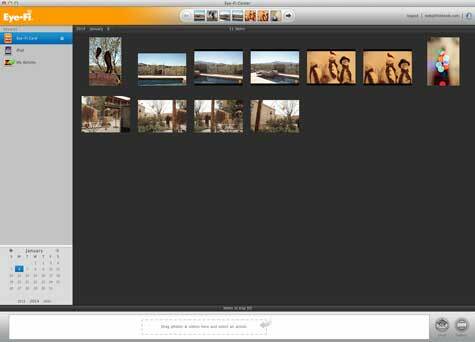 The Eye-Fi Pro X2 card brings that workflow one step closer to instantaneous for image review, sharing, correction, and archiving. During a professional photo session the client, photographer, and photo stylist may need to review the work in progress to ensure the best possible outcome. This team approach to midstream adjustments can be leveraged by using the much larger screen real estate of a tablet or computer. A wise photographer once said, “Until your image files are in more than one place, they really are not any place at all.” If something happens to your camera and/or memory card, your images are still safe; the nightmare of dropping your camera into the Grand Canyon or a volcano come to mind. The photojournalist scenario is where the camera and/or card are confiscated just after the photographer captures that Pulitzer Prize winning image. This system is supported by a three legged structure: the computer application, the tablet app, and the Eye.fi website. Setup and use of this system are straightforward and not overly fussy. The card ships with the Mac and Windows applications installed. The included USB adaptor eases the application installation. The iPad and iPhone apps are available for free at the App Store. The geekiest part is setting up the network connection on the computer and tablet. The included instructions are clear enough to make this process possible with out breaking a sweat. Your photos and videos are automatically transferred from the camera to the tablet or computer when in range of the Wi-Fi radio transceiver. From there copies will be uploaded to your personal space on the Eye-Fi web site, where they will stay for seven days. 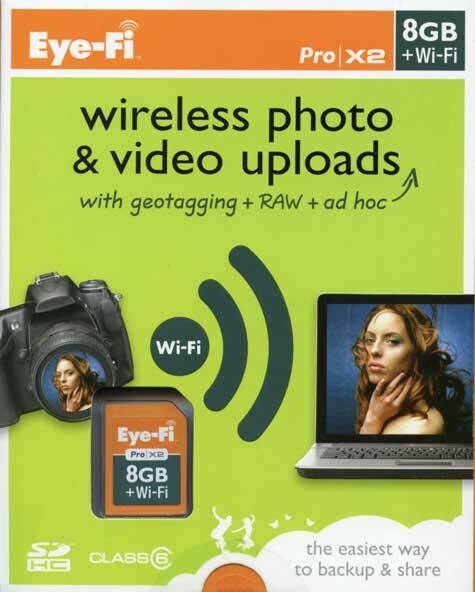 If you wish to save your photos on your Eye-Fi account for a longer period the company offer a premium upgrade. 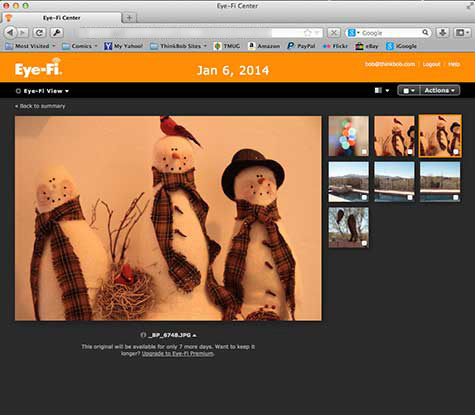 Your images can then be sent on to social media outlets, print houses, and personal or corporate FTP storage sites. The support for other sites seems very comprehensive. In use the card is just like any other SD memory card. My review unit is an 8GB Class 6 card that is no longer listed on their web site. It would seem to be replaced by the 16GB Class 10 unit. I presume it to be all the same, only bigger and better. I do have suggestions for a couple of aspects that can could be improved. The applications and web site, although good, could be more Mac like and intuitive. The card only comes in SD-HD format and many current professional cameras use CF (compact flash) cards. My Canon 7D is one of those and therefore officially unsupported by Eye-Fi. Third parties make SD to CF card adaptors that promise to work with Wi-Fi cards. I have one of those and it does work in nearly all respects. The only problem that I have found is that I seem to be able to review only the most recently taken exposure. The preview for any earlier image does not appear and the screen on the rear of the camera states that it is unavailable. The images transfer to the computer fine and are undamaged. This card supports GPS geo-tagging, and indeed that information is available in the applications but does not automatically appear in Apple’s iPhoto or Adobe Lightroom. 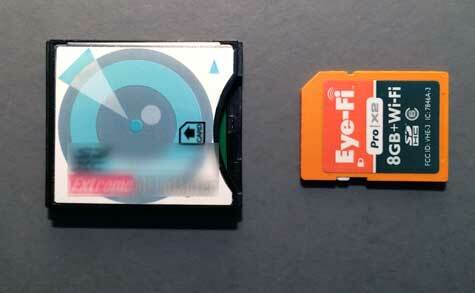 The Eye-Fi web site cautions against reformatting the card when installed in a CF adaptor. I wish that Eye-Fi would issue their own supported SD to CF adaptor. Maybe this will happen in the future. MyMac Podcast #491 – Ready to be Connected?